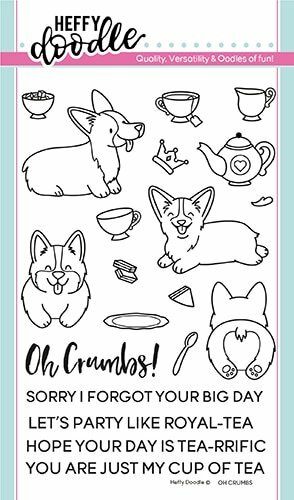 Stamps > Heffy Doodle Clear Stamps "Oh Crumbs"
Heffy Doodle Clear Stamps "Oh Crumbs"
Get ready for a party with some royal pups with the Oh Crumbs stamp set. These cute corgi dogs are enjoying a fun tea party with style. The set includes 15 images including a teapot, tea drip, two teacups, milk / creamer jug, sugar bowl, plate, spoon, two sandwich stamps and a crown. There are four corgi dog images, two of which are back-to-front images - one of the dog's face and the other of his fluffy bottom, enabling you to recreate the classical corgi sploot! This set also includes some general sentiments and a 'Oh Crumbs' stamp in a script style.